Winter weather in Koguryo was very cold. So, a warm dwelling environment was very important in their lives. 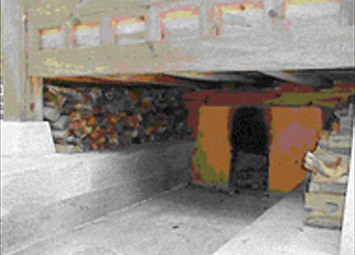 Koguryo people invented the “ondol [meaning: Warm Stone]” heating system in which a floor stone is heated by burning fire at one end of the room with the smoke traveling underneath and exiting at the other end, making the living space warm. The system was widely used in palaces, temples and military posts, as well as houses of ordinary citizens. Ondol heating that is in use at most of the contemporary Korean dwellings today originated from Koguryo. However, in Koguryo, only part of a large room had hot-floors heated by this method. Other furniture such as wooden tables, beds or chairs were placed in other parts of the room so that people could sleep at night or sit around for daily routines. Comfortable jackets and trousers for outdoor activities were the basic garments for Koguryo men. Unlike Chinese men who wore skirts, Koguryo men wore trousers that were favorable for horse riding like nomadic people of the northern region. They closed the front of a jacket to the left and tied the waist without buttons. This style was intended to increase efficiency and convenience when shooting arrows. Women wore a variety of skirts such as pleated, rainbow-striped or polka-dot skirts. But they also wore comfortable trousers. 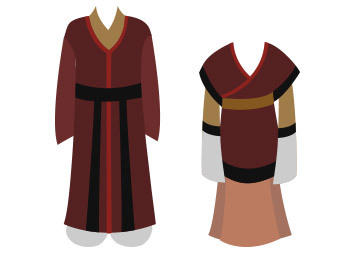 Often they would enjoy wearing outer robes adorned with bright patterns. Most Koguryo men wore a topknot hairstyle and a hat. Women wore various hairstyles and sometimes used wigs. 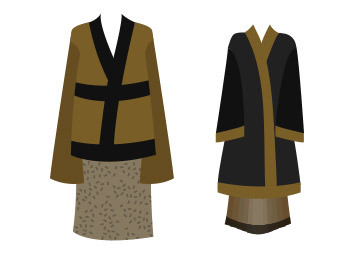 In Koguryo, colorful clothing styles flourished as a variety of clothing materials including silk was produced thanks to its advanced dying technology. Even serfs wore colorfully patterned clothes. Generally, men preferred comfortable and practical clothes, and women liked to wear comfortable yet beautiful dresses. Koguryo people enjoyed diverse diets. Rice, beans and millet were staple grains, while barley, wheat and Indian millet served as a subsidiary diet. Toward the latter period of the kingdom, consumption of rice increased. With regard to diet of the early period, they ate hot gruel by grinding up grains and boiling them with water in earthenware (like “grits”). They soon switched to grains steamed in an earthenware steamer, and then they learned to boil rice in a cauldron (which is the way Koreans cook rice today). The representative Koguryo dish was “maeg-jeok, or roasted meat with seasonings. 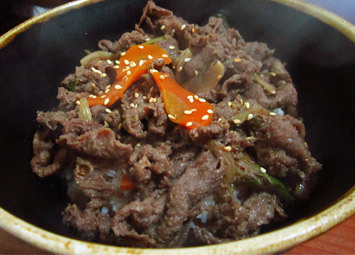 This is the predecessor of today’s “bulgogi” (roast beef), one of the most famous Korean dishes. A dinner table of Koguryo people would consist of half a dozen different foods prepared in various-sized dishes, including fine dinnerware called “judu,” on a table called “joban.” They ate their meals with spoons and chopsticks. They also used a small knife called “ojado” to cut meat into small pieces. They would also have cabbage, lettuce and radish preserved with salt. In later generations, people would add red peppers to the dish, and this is the origin of Korea’s world famous “kimchi” (fermented vegetable dish). The home of beans, Koguryo would use beans to make various sauces made from beans, like soybean paste and soy sauce. They also enjoyed brewing rice wines. Religion played a significant role in the life of Koguryo people. They not only held memorial rites for ancestors frequently but also worshipped them as supernatural beings, or gods. King Chumo, the founder of the kingdom, and his mother, Lady Yuhwa, were examples in point. They were anointed respectively as the “God of Godeung” and the “Goddess of Buyeo” after their deaths and were subsequently remembered and revered at the Dongmaeng Festival, the kingdom’s largest annual festive event. The people at the time believed that the king was an offspring of God of Heaven, the god of the highest standing among the people. That the kingdom was founded by the son of the highest god meant that their country was the most divine of all, a belief that was the key source of national pride for the people. It was in this context that the people of Koguryo kept performing rituals during the Dongmaeng festivals, which were designed to confirm and deepen the faith that King Chumo had indeed been a god’s descendent who was born on the land of their kingdom. worshipped a variety of gods, including the god of the sun, god of the moon and ‘gods of functions,’ like the god of agriculture and god of fire. Shamans and ritual masters performed religious (sacrificial) rites, and shrines were constructed where god-worshiping activities took place frequently. Kings would never be absent from these ceremonial rites for the God of Heaven and the God of Ancestors, as well as the Dongmaeng Festival. What brought a new wave of change to the religious life in the kingdom was Buddhism, which was recognized by the government as a religion in A.D. 372. It presented itself as a full-fledged religion that featured specific images of Buddha and a formal organization of practitioners. Supported by kings and their royal families, Buddhism began flourishing, building temples at numerous locations and setting up huge pagodas and gold-plated Buddhist statues (inside the temples). The Buddhist monks of the kingdom spread the religion to its neighbor, the Silla Kingdom, while also playing a vital role in disseminating the Buddhist region and culture to other parts of the region, including Japan. Korean spoken in North Korea is originated from Koguryo. The Koguryo language is unknown except for a small number of words, which mostly suggests that it was significantly different from the language of Silla or Tungusic languages. The Koguryo names for government posts are mostly similar to those of Baekje and Silla, two other kingdoms of Korea. The languages of Koguryo and Fuyu (Buyeo), East Okjeo, and Old Joseon (Go-Joseon) were similar, while Koguryo language differed significantly from that of Malgal (Mohe). Similarities in certain vocabulary with old Japanese have been noted as well. 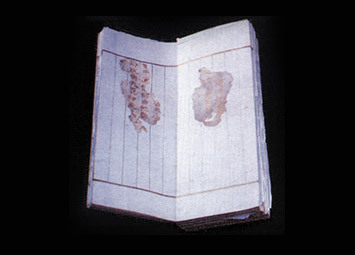 Some words of Koguryo origin can be found in the old Korean language (early 10th-late 14th centuries) but most were replaced by Silla-originated ones before long. Some linguists propose the so-called “Fuyu languages” that included the languages of Fuyu, Koguryo, and the upper class of Baekje, and Old Japanese. Supporters of the Altaic language family often classify the Koguryo language as a member of that language family. People of Koguryo were fond of dancing and singing. Because they lived in a tense society, which had to fight wars constantly, and whose rules and laws were stringent, the citizens understandably found a relaxing pastime they needed in festive activities, such as drinking, singing and dancing. Come every October, the kingdom held various events, ceremonies and festive activities, including the Dongmaeng Festival (whose main purpose was to worship the gods of heaven and ancestors), where citizens of all levels gathered and enjoyed the event together. Unlike the memorial services of the Chinese, characterized by rigid formalities and solemn appearances (so as to stir up the fear of gods among viewers), Koguryo’s events and ceremonies (the Dongmaeng Festival, in particular) provided a forum of festivity where people mingled with one another, engaging in drinking, singing and dancing activities (in celebration of the “gods’ descent to this world”). In the beginning of each year, as was the custom, many village people would join in the festive events held at riverside locations. Kings also used to come and watch citizens enjoying entertainment activities, which included ‘stone-throw games,’ a custom that has been handed down to the mid-20th century. Other popular pastime activities the Koguryo people enjoyed included games like “baduk” (“go”), “jang-gi” (Chinese chess), “chukguk” (soccer), dice-play, “yut-nori” (the four-stick game), “tuho” (throwing-arrows-in-jar), ssireum (“sumo”) and a bare-hand duel called “subak.” Subak eventually evolved into Taekwondo, Korea’s most well known martial art, as the sport passed through the Goryeo(Koryo) and Joseon Kingdoms. Ssireum, which has become a very popular sport today, is a game of wrestling in which two players compete to wrestle the other to the ground using cloth-sashes, which are tied around the waists and thighs of the players. People also enjoyed circuses brought from Central Asia, listening to musical performances, or playing musical instruments like the six-string Korean zither or flute. 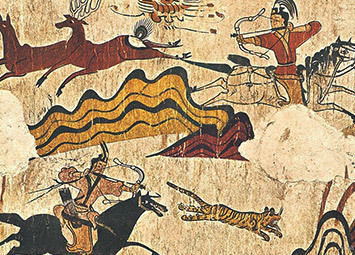 Hunting was also an important pastime. Interested individuals would form large-scale hunting squads, and run up and down mountains and across open fields. They would set up shooting targets and hold archery-shooting contests. Those with outstanding archery skills were named “Jumong,” the nickname of King Chumo who founded the kingdom, a tag of honor. Meanwhile, young people would take academic as well as archery lessons at “gyeongdang,” an educational institution, receiving a balanced training that eventually paved the way for the kingdom to foster strong military power. In terms of marriage customs, the kingdom had a practice called “seo-ok-je,” in which the bride’s family would build an annex (“Seo-ok’) to their house and have the new couple live there and rear children until they fully grew up. This custom would disappear toward the late period of the kingdom, when it was replaced by a more liberal concept of marriage, allowing young ones in love to marry without undue delays. Funerals also carried particular significance. Large-scale funerals were favored and hefty sums of money were paid for them. The objects that the deceased had used during his/her lifetime were buried together with the dead. This custom was modified during the late period of the kingdom, when the belongings of the dead were placed at the side of the grave, so that funeral guests could take them. The Koguryo people would deeply mourn with sorrow and tears at the loss of their loved ones; but as was the custom at the funerals, they would ‘send off’ the deceased with dances, songs and music. 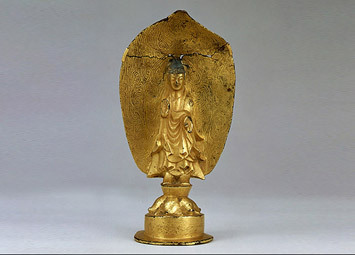 Many Koguryo-era cultural assets have been recognized as world-class cultural heritage. Examples of these assets include tomb murals that are widely known for their sense of using bright colors and a variety of painted images, the 1,500-year-old fortresses and walls that still stand high in grandeur, as well as oversized, monolithic monuments. The kingdom had an abundant supply of mountain rocks. Taking advantage of this, they built robust bulwarks at strategically important defensive points and transportation crossroads. Its fortresses retained the best of its architectural technology. 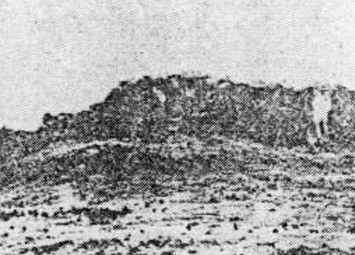 The “chi” around the fortress was the protruding sections of the walls that enabled soldiers to launch an effective three-front defense, which of course enhanced the defense capabilities of the bulwarks. To ensure that these defense structures would not crumble easily, they deployed solid, large rocks at the bottom and smaller rocks for the upper parts of the structures. Angles of the walls were carefully laid to ensure maximum stability. Rather than chip off cliffs or rocks, they took advantage of natural dispositions as they were; and when they built defensive walls they laid the rocks in an interlocking way, a technique to build the walls as defensively strong as possible. The superiority of Koguryo’s architectural techniques was widely known to neighboring countries and influenced their culture as well. Knowing that Koguryo fortresses were hard to breach, regional powers would hold back from challenging Koguryo. The 1,500-year-old Koguryo ramparts are still extant all over the old Koguryo territory. Knowing how to work with rocks, the people of Koguryo used to build gigantic stone tombs. 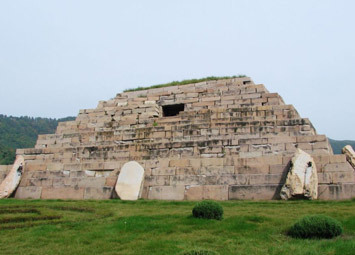 The royal mausoleum of King Jangsu (r. A.D. 413-491) is the prime example. It stands like a pyramid that measures 31 meters each side and stands 13 meters high, a reason that it is dubbed the ‘Pyramid of the East.’ There are over 10,000 stone tombs of this style and others (stone chambers covered with dirt on top) still extant; one of them measures 71 meters each side. Tomb guards used to take care of the mausoleums of kings and aristocrats and ceremonial services have taken place on a regular basis. Then, there is King Gwanggaeto’s Monument that stands in front of the king’s mausoleum. Built by his son, King Jangsu, in A.D. 414, this rectangular monolith stands 6.39 meters high and weighs 37 metric tons. A total of 1,775 Chinese characters were engraved on all four sides of the monument, which is widely recognized for its historographical value today. The Chinese inscriptions describe the “rules of care” for tomb guardians, a brief history of the kingdom, and the genealogy of royal families, as well as the great achievements of King Gwanggaeto. 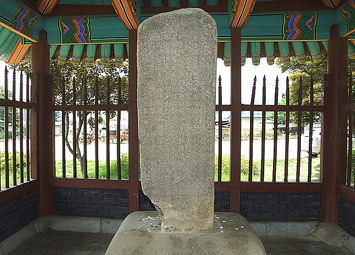 Another Koguryo-era monument, called “Jungwon-Koguryo-bi (the central region monument),” was excavated in 1979 in Chungju, South Korea. About 2,000 words were engraved on it. Although scholars were so far able to read only one-tenth of the inscriptions, about 200 words, it nevertheless provided invaluable information about how the kingdom governed its southern territories. 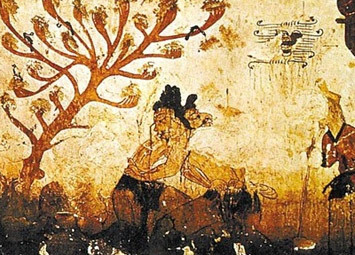 Of these tomb paintings, those found inside Anak No. 3 Tumulus (featuring a long procession of 250 participants), the Tomb of the Dancers (hunting scenes), the Large Gangseo Tumulus (a tortoise), and the Middle Gangseo Tumulus (a phoenix) well deserve to be honored as excellent examples of the world’s best artworks among their contemporaries, given the exceptional techniques deployed in the handling of colors and brush strokes. Also, the paintings in the Fourth of the Five Tombs (portraying deities and hermitic figures) still retain much of their magnificent colors, and continue to mesmerize viewers.